It’s time to tap the trees in our neck of the woods. Not that we have woods (much to our chagrin). All it takes is a maple tree or two, a few pieces of simple equipment, and a love of pancakes dripping with real maple syrup. Actually, scratch that last prerequisite. We rarely ate pancakes before we converted our suburban yard into a sugar bush. I couldn’t convince Neil to eat pancakes when we first married, which was rather disappointing as I find them delicious. I had resigned myself to a life without pancakes, when lo and behold! Neil started making syrup. Sugaring, like most of our other pretend to be farmer hobbies, snuck up on us. Neil’s friend encouraged him to try it and gave him a couple taps & buckets. That was six years ago, and we now look forward to syrup season and yield enough to last the year. Sap flows when temperatures are above freezing during the day & below freezing and night. For us, this usually happens sometime in February or March. Drill a hole in an adult maple tree. “Sugar maples” yield a sweeter sap, but all have sap that can be boiled down into syrup. The hole should be about 1.5 inches into the tree slightly angled toward the ground. Use the recommended drill bit for your spile (5/16 for plastic or 7/16 for the old style metal). Then gently tap in the spile in with a hammer. The bucket hooks onto the spile or tube is connected and is covered to prevent rain or snow from getting in. Collect the sap. 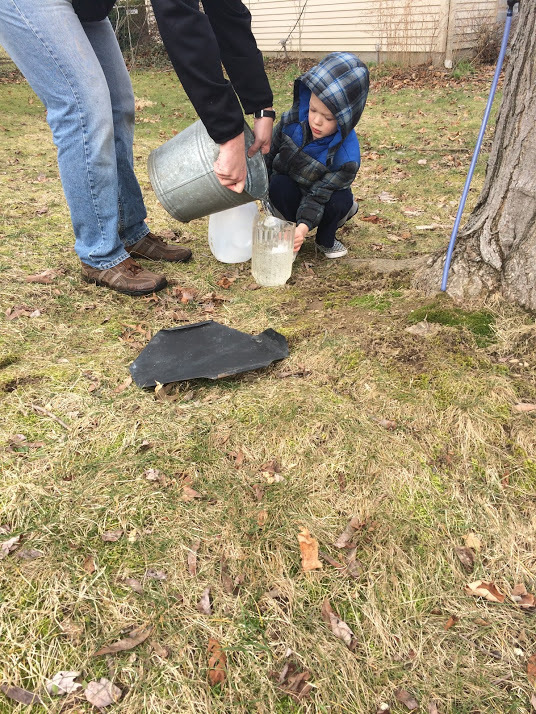 Check your buckets about once a day and collect the sap. We store it in pitchers or clean milk jugs. Store it as you would milk, below 40 degrees Fahrenheit. Or you can freeze it. When you’ve collected a few gallons, get a fire going outside. You can use a “turkey burner” with propane or a wood fire with the pan set above on something like cinder blocks. Of course, the wood fire using free firewood is much cheaper, though less convenient. The wood fire also harkens back to sugaring parties of pioneer days. 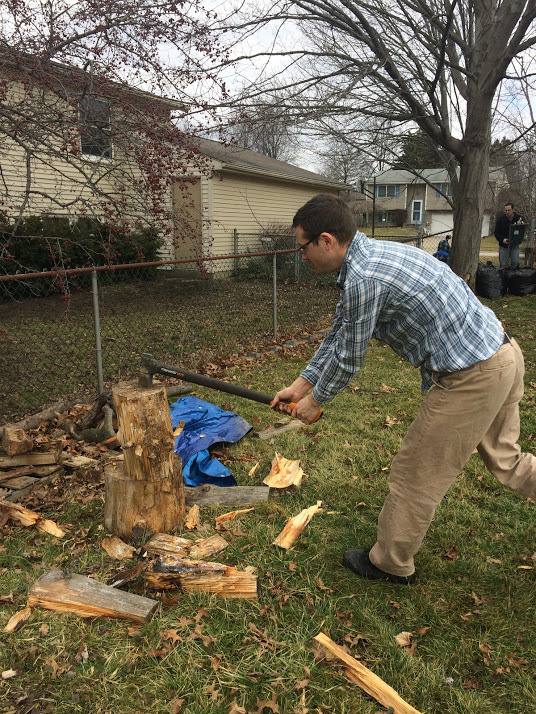 Splitting wood for the fire. Boil it to 7.1 degrees Fahrenheit above the boiling point of water in your elevation. This will take a while—the sap to syrup ratio is about 40:1. We switch to a small pan at the end to finish it. You can take the temperature with a candy or meat thermometer. The legit method is to use a hydrometer. There are also a host of non-technological “how it looks when falling off the spoon traditions,” but I’m not so good with that type of subtlety. Watch out! It burns fast. We know from experience. We filter through a cheesecloth into glass jars while it is still hot, which sufficiently sterilizes it for storage. Let it cool completely, then freeze whatever you won’t use within the month. Make pancakes! Or whatever you love to eat syrup on. My favorite recipe is Fluffy Pancakes. We also like Maple Almond Granola and it can replace the honey in Playgroup Granola Bars. Considering our very infrequent pancake consumption before sugaring, I have no illusions that making syrup has saved us fat stacks of cash. Confession: we actually used to buy the deplorable imitation syrup since we didn’t use it often. After purchasing equipment, it’s probably just starting to save money compared to buying the real deal. However, it’s also a pastime that fits the bill for us–it’s productive, kid-friendly, happens outside, and isn’t expensive. We love that it’s a thrifty throwback hobby. Anything described in the Little House books is guaranteed to get me excited. Except the grasshopper plagues and scarlet fever, of course. And what’s not to love about the sheer efficiency of using what you already own? Another reason I love making syrup is that it’s a sign that spring is just around the corner. It’s a great excuse to get outside at the end of winter, enjoy the slightly warmer days, and make use of your yard before it’s time to plant the garden and raise chickens. It’s become a talking point with the neighbors, and they’ve even graciously allowed us to tap their trees. It’s also a great hobby for families. 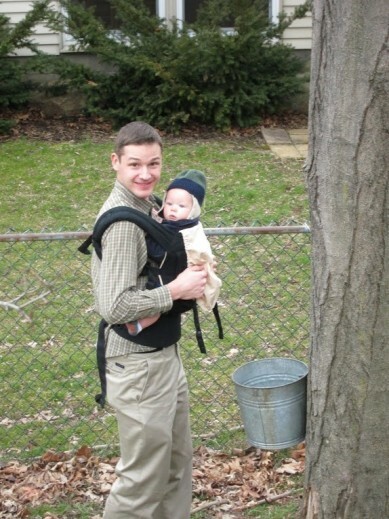 Our son loves checking the buckets, helping collect the sap, and hanging out around the fire while it boils down. And of course, the kids love eating pancakes. Pancake breakfasts have become a hospitality staple in our home. Inviting people over for breakfast can be less expensive, easier to schedule, and more casual than a dinner invite. And who doesn’t love carbs drenched in sugar? Happy maple syrup season! I hope you consider putting your untapped potential to delicious use if you have a maple tree. 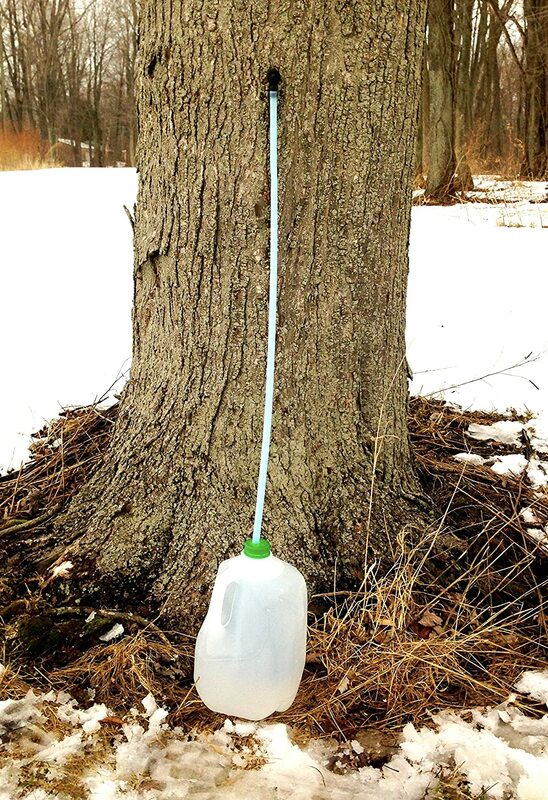 What are your burning questions about boiling sap? Do you have a similar hobby? This is really interesting, since I see people with just a few buckets out and wonder, what can you do with just two or three trees’ worth?? Now I know! You also make it sound much simpler than I imagined it to be. I LOVED Little House! Once I woke up and my vision was strangely blurry, so naturally I thought I was going blind, like Mary, from scarlet fever. Turns out I had my contacts in the wrong eyes. Sadly, this is a true story. Two trees’ worth is enough for our family for the year! Which I never realized or thought it would be worthwhile or easy until we tried it. That story about your dream is so funny! Mmm, that looks so delicious! I think one of my goals is to learn some DIY things that my grandparents were so amazing at like gardening, canning, wood work, etc., in the next several years. I think we just get so used to going to the store to buy everything that we take “the process” for granted. Next on my list is to learn canning. We waste too much from the garden because we don’t preserve it all. 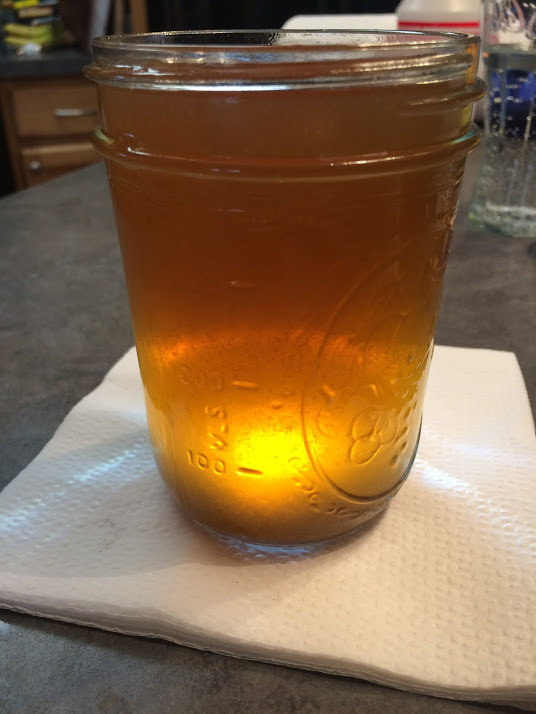 My husband’s uncle makes homemade maple syrup (he has something like 20 miles of tubing), and it tastes amazing! I’m impressed. Even if we didn’t live in Arizona, this is something I’d never, ever bother with. Then again, I’m more than happy to have a restaurant make me french toast. Still, I imagine there’s nothing better than the triumph of eating your own syrup. Plus I can imagine just how impressed people would be to receive some as a gift. I can completely see why this endeavor would have no appeal for a lot of people. It is especially delicious after the work involved, and makes for something special to share. That’s awesome you guys have that option, so much better than store bought. We live too far south, although we have wild blackberries that grow in the summer on our property. Wild blackberries are amazing. That’s great you can enjoy natural treats from your yard! Hi, where do you guys live? I thought that the weather was critical for this, warm during the day but freezing at night. I don’t think one can do this in the south like somebody suggested. Anyway, I love your blog. Canning is easy with the internet for a guide :). I’ve taught myself so much like making salsa and canning jelly all with online help. We are in the Midwest. You’re right that it won’t work too far south. My husband actually has canned salsa and peppers, but I’ve just been on clean-up crew. Now I want to learn so we can freeze and can more. This is awesome! We love having pancakes every once in a while and it would be awesome to be able to use homemade maple syrup instead of store bought. Our pancake consumption really increased with having kids, which I suppose also coincided with making syrup. It’s fun! Amazing that you do this in a suburban yard! I have always romanticized maple sugar making, and the few times I’ve been able to help out with it (friends who live in the country – who don’t romanticize it), I feel like I’ve put my watch back about a century – in the best way. I also love maple syrup. I cannot go back to imitation – no matter how much less expensive it is. I never knew it could be done so simply, or that a couple trees could yield so much, until we gave it a try. It is so much tastier than the artificial stuff. I didn’t realize it was so straightforward and accessible to make until we tried it, either. Its glycemic index is similar to honey or molasses–a little better than regular sugar but it’s still very sweet. The sugar in maple sap is mostly sucrose so it would affect diabetics about the same as regular sugar. Birch syrup might be a better alternative for a diabetic because birch sap contains more fructose than sucrose. This is so cool, I want to try this now. We moved to our home two years ago and it sits on about 11 acres, so we’ve been doing a lot foraging and discovery. Having grown up in the suburbs, without much exposure (or paying attention to) trees and whatnot, I’ve been learning a ton and identifying maple trees is one of them. Now I have to take advantage, thanks for this post! I’m excited to hear you’re inspired to tap your trees. I hope you have fun! I’m also a little jealous of your 11 acres! We would like to have a little larger property someday. I know I’m weird because, while I enjoyed making maple syrup, I prefer eating the artificial stuff. Maybe because that’s what takes me back to childhood? There is something nostalgic about the flavored corn syrup! I learned to finish syrup by watching how it foams and how it runs off the back of a spoon by watching my parents when I was 10 or 11 years old. When I started making syrup as an adult I tried using a thermometer and burned my first batch. I went back to the nontechnical ways with the next back and haven’t had a failure since. Last fall I bought some property that has a 30 acre sugarbush with a sugarhouse that hasn’t been used since the early 1990s. It has the potential to make 600 gallons of syrup per year. Making it functional again is this year’s big project so I can use it next year. I still need a marketing plan for that much syrup. I remember reading mention of the spoon method in Little House in the Big Woods. I do wonder if our syrup might come out a bit thicker if we used that method. We’ve never burned it by using a thermometer, only by not watching carefully enough. Wow, that sounds like a great adventure! I hope all goes well and you can find a way to market your syrup. Whenever the world progresses, it will leave treasures in nature without benefiting from them, Our ancestors were healthier than we are today, Yes, they have learned to enjoy everything in nature.